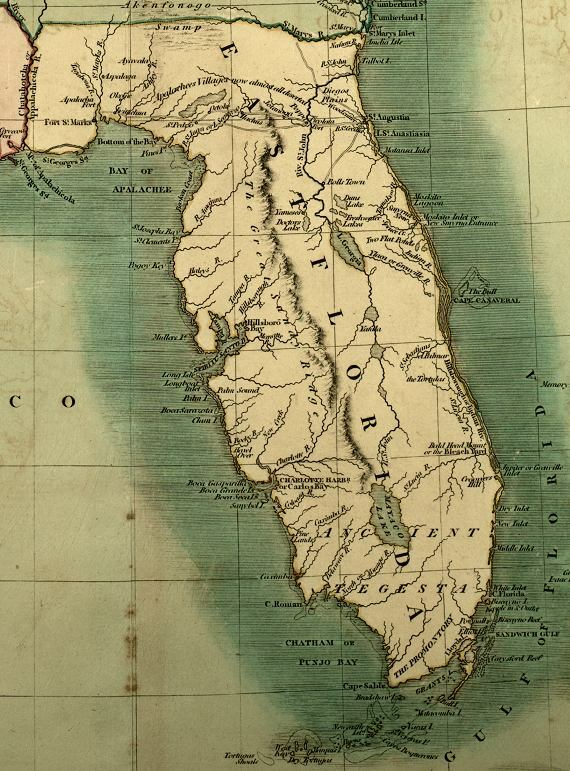 Description: A detail from the 1806 map of the United States showing the Spanish territory of East Florida. This map shows coastal features, major lakes and rivers, and settlements. Relief is shown pictorially. Certain place names reflect English, variations, such as West Key for Key West, Chatham or Punjo Bay for Ponce de Leon Bay, Sandwich Gulf for Biscayne Bay, and Mayaco Lake for Lake Okeechobee. The route between St. Augustine and Fort St. Marks is shown, with a note that "Apalachees Villages now almost all deserted." The full title of the original map is "A new map of part of the United States of North America containing the Carolinas and Georgia. Also the Floridas and part of the Bahama Islands from the latest authorities." Digitization provided by the USF Libraries Digitization Center. Rare Maps.